Still one of he greatest films ever made in my humble opinion. Even today and into its fourth decade it still stands alone as one of the true great movies. With a near perfect cast and the added bonus of a triumphant treble tour de force performances from both Roy Scheider and Richard Dreyfuss and more importantly Robert Shaw who majestically guides the second part of this film into genuine movie brilliance. Not only is this film full of wonderful set pieces and suspense and thrills aplenty that will have you on the edge of you're seat but it also as a wonderful script that is brought to life with some of the best ensemble performances ever assembled and therefore put this movie on another plateau altogether. This film deals intricately with many complex issues and problems besides the obvious focal point of a Carcharodon Carcharias that is summarily eating anyone who innocently become victims of its natural ability to hunt out and kill anything of its choosing. 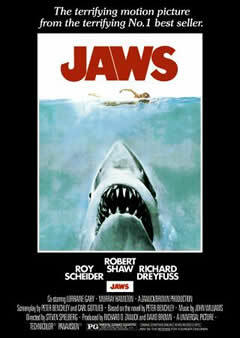 This film is not just about a maneating shark that terrorizes the people of Amity Island. The fact is that this films depth is like the sea on which we spend much time upon and as no bounds and therefore brings with it a often forboding and frequently scary and spell bounding journey about life and death itself. Directed by a up and coming director known as Steven Spielberg (whatever happened to him?) and with writer Peter Benchley's storyline thrown in for good measure care of Carl Gottlieb's screenplay then surely it was never in doubt that this movie would become one of the best and greatest movie feasts of all time. It is exactly that, a feast of visual mastery and nothing in the same vain as been made since its original filmic inception way back in 1975 and a perfect example of why I think the 70's was the best time for making groundbreaking cinema. It is still the bright standard bearer and will always stand the test of time forever more. When using the word 'masterpiece' to describe something indivdual and unique, then you have no need to look any further than Jaws for that supreme example. Put simply and despite the test of time it still as few flaws, yes even today and is nothing other than, "Quite brilliant". Eric: Thanks for the incredible comment! Thanks also for stopping by, and for being such a great follower on Twitter. It's much appreciated!